SVG is in Minneapolis covering everything video at Super Bowl Week. From Radio Row to U.S. Bank Stadium, SVG is on the scene covering all of the video production and tech happenings at Super Bowl LII. Through Super Bowl Sunday, SVG will bring you daily episodes of The SVG Podcast as Chief Editor Jason Dachman and Director of Digital Brandon Costa give you the inside scoop on everything they are seeing and the big themes they are hearing from all of the big video-production players here in the Twin Cities. In addition, each episode will feature an in-depth interview with a major executive or intriguing personality that dissects their team’s onsite Super Bowl efforts and offers their opinions on larger trends facing the sports media industry. On today’s episode of the show, Jason and Brandon discuss NBC Sports’ onsite studio sets, go deeper in the 3D scan-graphics technology that will be deployed throughout the game and venture out of U.S. Bank Stadium to see what NBC Sports’ RSNs and Barstool Sports are up to. 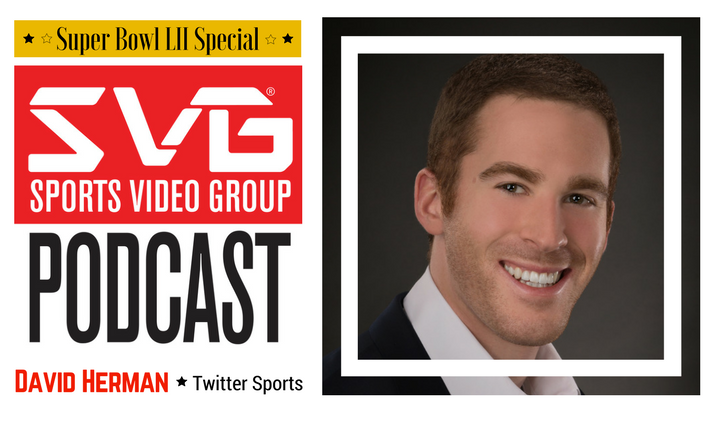 Brandon also catches up with David Herman, sports partnerships manager, Twitter Sports, to discuss the social-media giant’s content strategy here at Super Bowl LII; how his team helps leagues, teams, and networks best use the platform; and how video is becoming a more prominent player in the social-media space.